Vive la Littérature! Vive la Liberté! 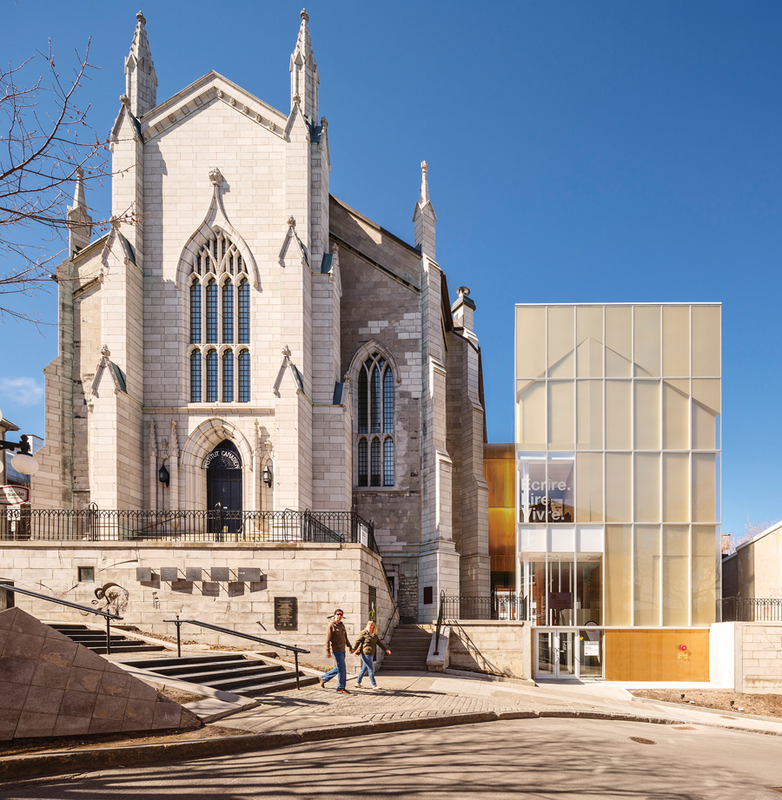 A renovation and addition transform a church in Old Quebec City into a centre for celebrating the province’s literary heritage and fostering a new generation of writers. “Each page of a book is a city. Each line is a street. Each word is a dwelling,” wrote Réjean Ducharme in his first novel, L’avalée des avalés. Authors rarely transform an existing book—but architects often have to add to the existing book of the city, inevitably modifying its meaning in the process. Through this lens, how does one transform a 19th century church into a contemporary space dedicated to literary culture and creation? This is the challenge Chevalier Morales Architectes and three other selected firms faced in a 2011 competition to create a Maison de la littérature in Quebec City’s historic core. The former church was gutted as part of the renovation. Photo: Chevalier Morales Architectes. 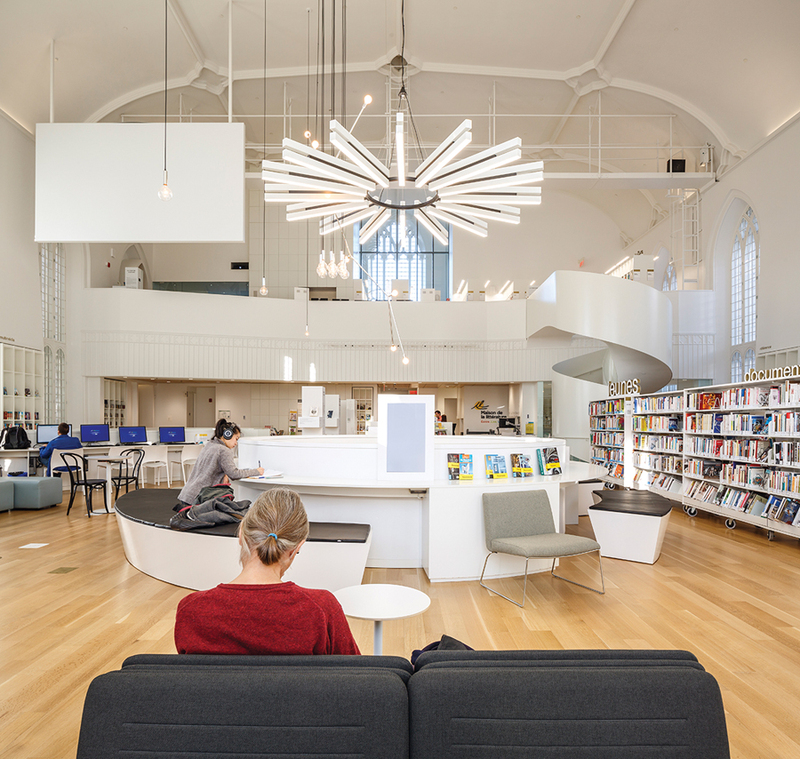 Chevalier Morales’ winning solution involved the restoration of the church’s vast interior space as a light-filled library, bistro and exhibition venue focused on Quebecois literature. They also added a glass pavilion housing a resident writer’s apartment and a suite of creative studios. Through the paired structures, the architects succeeded in creating a unique and positive hybrid experience. 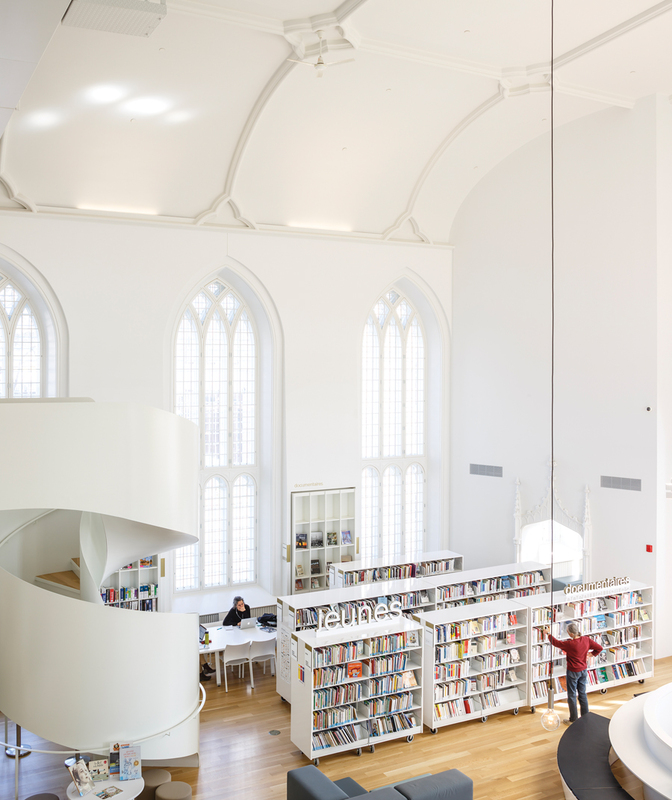 The completed Maison is dedicated to authors and readers, but also acts as an exemplar of adaptive reuse in Quebec City’s historic heart. 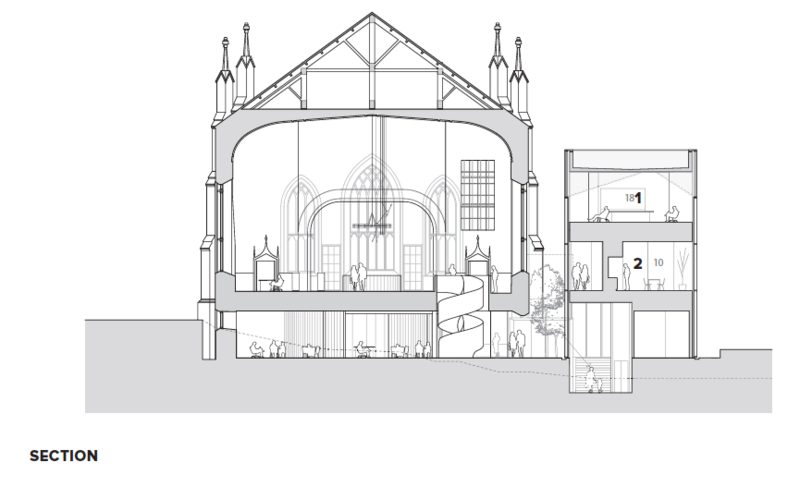 The Maison de la littérature project was devised by Quebec City’s non-profit Institut Canadien, which owned the former Wesley Methodist Temple, a Neo-Gothic church built in 1848 (the same year that the Institut was founded). Abandoned in the early 1930s after the congregation merged with another, the building was transformed for the first time in the mid-1940s, after Senator Lorne Campbell Webster helped the Institut purchase the Temple to house Quebec City’s inaugural public library, as well as a concert hall and its headquarters. The Institut went on to develop the city’s network of public libraries. After the concert hall closed in 1999, it decided to use the extra area to actively foster literary creation. In 2005, it began welcoming writers-in-residence, then announced the 2011 competition to completely transform the building to fit this new program. Sculptural staircases join the three main levels. Opened last fall, the Maison continues the Institut Canadien’s long-standing mission to bring knowledge and culture within everyone’s reach—but also attempts to reimagine the role of literature in today’s digitally dominated landscape. Already in the early 1980s, it advanced a new type of open-plan multimedia library when it was involved in building Quebec’s central library, Bibliothèque Gabrielle-Roy—a design that inspired many later projects, including Montreal’s Grande bibliothèque. With the Maison, the Institut hopes to put Quebec’s rich literature in the spotlight, but also to adapt its presentation to our increasingly dematerialized context by juxtaposing creation, dissemination and exhibition spaces. The goal is to explode the traditional program of a library, breaking down separations between spaces for reading, writing and speaking. A custom luminaire recalls a chandelier that hung in the later theatre. The spirit of liberty and exploration that the Institut called for inspired Chevalier Morales’ approach to the competition. 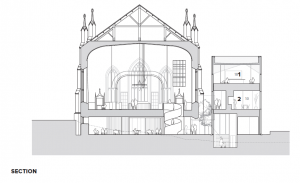 While the brief stated that no physical expansion was planned—and that the project should essentially limit itself to an intervention within the existing church’s walls—the architects felt such a solution inappropriate. 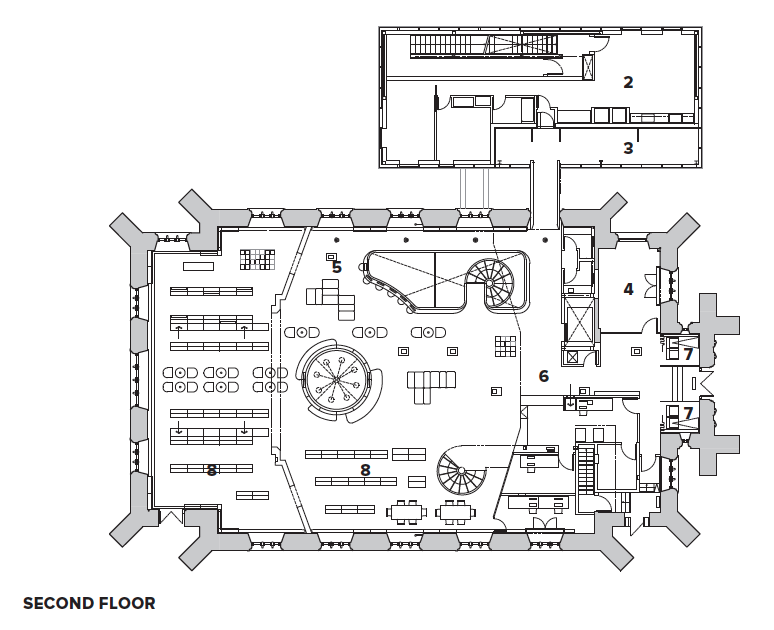 They took a gamble by proposing an addition to the north of the existing building, on what was formerly a parking lot. The addition accommodates an apartment for a resident writer, and also includes a black-box creation studio, a comic arts studio and the Maison’s mechanical spaces. This move allowed the team to completely open up the vast space of the nave. It also presented opportunities to highlight heritage features, by exposing interior elements more clearly. Cathedral windows open onto the open volume of the reading room, which includes a variety of spaces for work and study. More fundamentally, it responds to what the architects saw as a conceptual problem. Why try to use a religious building associated with the Anglophone community—even if it has not served as such for more than 70 years—to house a secular institution dedicated to Francophone culture? This is especially resonant since opposition to Church censorship marked the history of the Institut and, later, that of contemporary French Canada. A similar secular approach shapes the layout. Instead of entering through the church door, visitors bypass the religious ceremony by making their way through a side passage between the church and the addition. The image of an ember and a feather in a box frame the beginning of the journey and the start of a permanent exhibition, designed by the architects and themed around the idea of freedom in Quebec’s literature. An oculus in the main floor brings light to a small stage and bistro below. The path leads through the ground floor literary bistro, a space visually connected to the library above through a luminous opening in the ceiling. 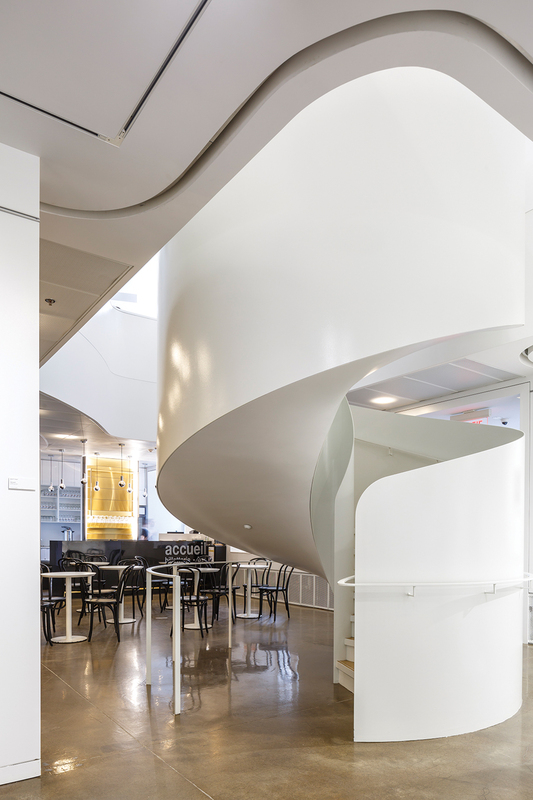 To reach the library, visitors ascend a sculptural white spiral staircase with high, opaque structural railings. The stair is similar to ones that Chevalier Morales has designed for other projects. 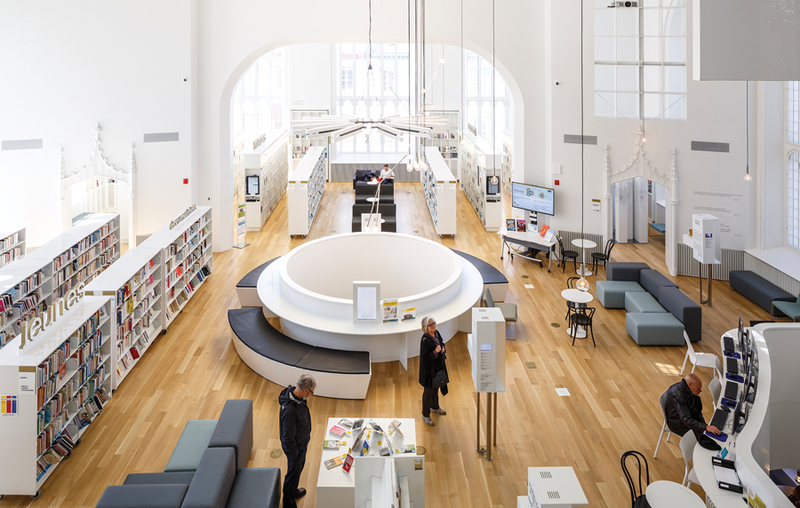 It effectively compresses space to create a dramatic entry into the almost completely white, light-filled library. 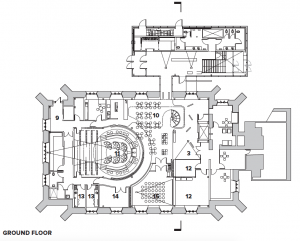 It also changes the visitors’ point of view: instead of discovering the nave from a traditional axial vision, they enter closer to its centre, with a view of the ceiling. Bookshelves are arrayed along the building’s walls. 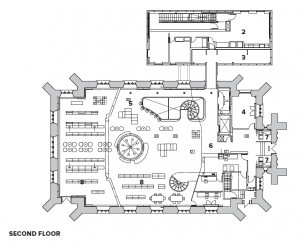 The central area is occupied by a variety of seating arrangements, while a second staircase leads to a balcony with quiet reading and writing rooms. As called for in the competition, an exhibition is integrated throughout the spaces, with authors’ portraits on white steles, artifact cabinets linked to wireless headphones, and videos of actors reading important works interspersed throughout the bookshelves. The shelves themselves, with many of the top rows currently empty, seem to almost be designed as exhibition elements. 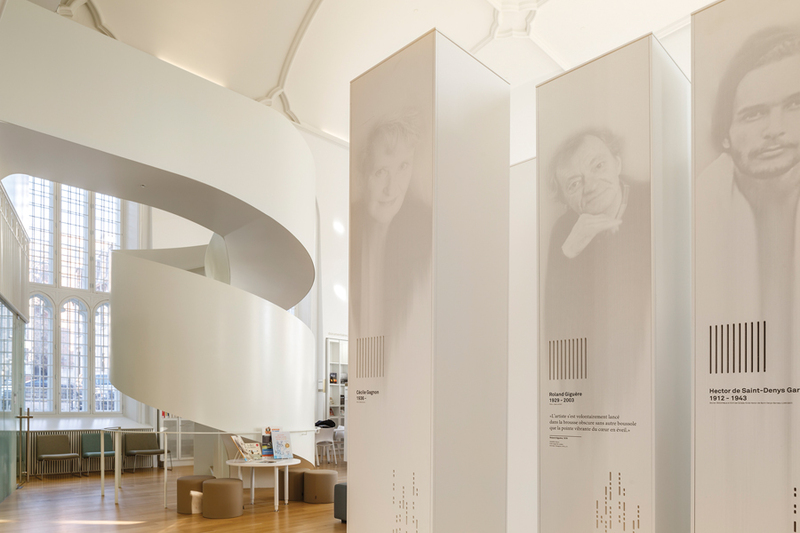 White pillars featuring notable authors are part of an permanent interactive exhibition that weaves through the project, themed around the idea of freedom in Quebec’s literature. 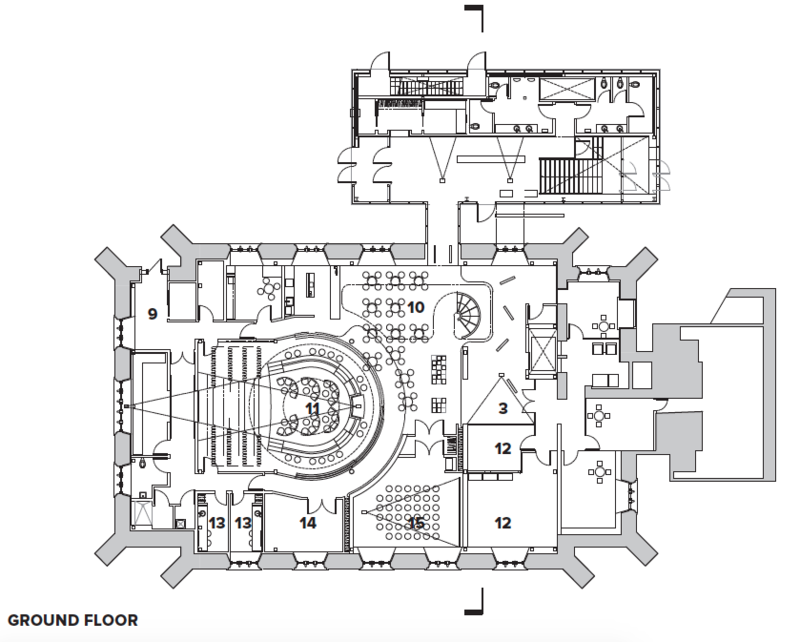 Despite their somewhat irreverent approach to the church setting and to the competition brief, Chevalier Morales used a rigorous and well-thought-out process to preserve the existing architecture. They recognized that few people remember the original state of the church and that its later uses and configurations are as important to its history. Thus, they chose to carefully highlight and restore elements from different eras, expressing the bricolage aspect of the church’s various transformations. A sunken seating area is part of the literary café on the ground floor. Photo: Chevalier Morales Architectes. For example, they uncovered the large original windows (unfortunately without their stained-glass elements, which had been moved to another church in the 1930s), kept the 1950s proscenium arch, and designed a new chandelier that echoes one without much aesthetic or heritage value, but that concert-goers had developed an affection for. Outside, the simple shape of the addition—a glass prism encasing a shining house-like form—uses its volume and setback to defer to and reflect the existing building. From the competition model to its opening, the Maison’s frank but subtle contemporary expression has been universally celebrated. This is a significant achievement in Old Quebec City, where residents are sensitive to architectural interventions that impact the historic urban fabric. 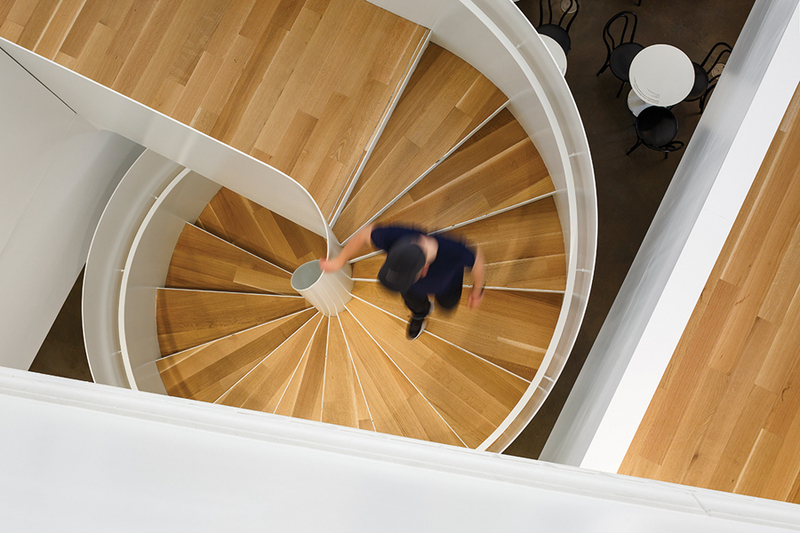 The spiral stair at the edge of the café ascends to the main reading areas on the second floor. In both program and architectural execution, the project is a brilliant success. Its creation spaces are continuously occupied. Readers, students and writers are always present in large numbers. Some would be there daily if the Maison were not closed on Mondays. More surprisingly, the Maison has already become an important stop in Quebec City’s tourist circuit, with numerous visitors flocking to enjoy its architecture. With the new pavilion of the Musée national des beaux-arts set to open this summer and the success of various other recent projects, Quebec City is slowly emerging as a place for thoughtful contemporary innovation in the urban realm. A brass-clad bridge links to the addition, which houses exhibition spaces, creative studios, and the apartment for a writer-in-residence. Chevalier Morales has demonstrated that experimentation pays off. Trusting the design and creation process can lead to inventive solutions that successfully respond to the needs of users. The 19th-century Quebecoise author Laure Conan once wrote, “A good book must always make a true connection between she who wrote it and she who reads it.” The best architecture must do the same. 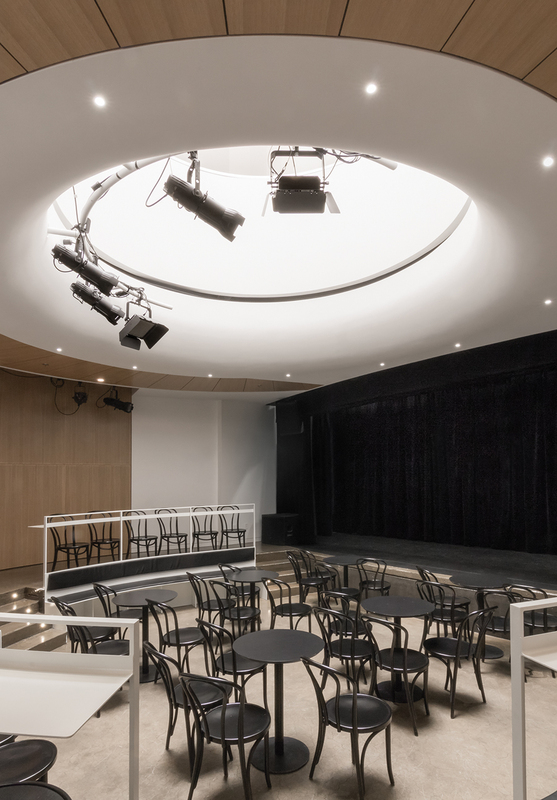 Here is the Maison’s success: it connects a respect for the architectural and institutional heritage of the Institut with an attitude of freedom inspired by Quebec’s literature. Olivier Vallerand is an architect with 1x1x1 Laboratory. He also teaches in the School of Architecture at Université Laval. 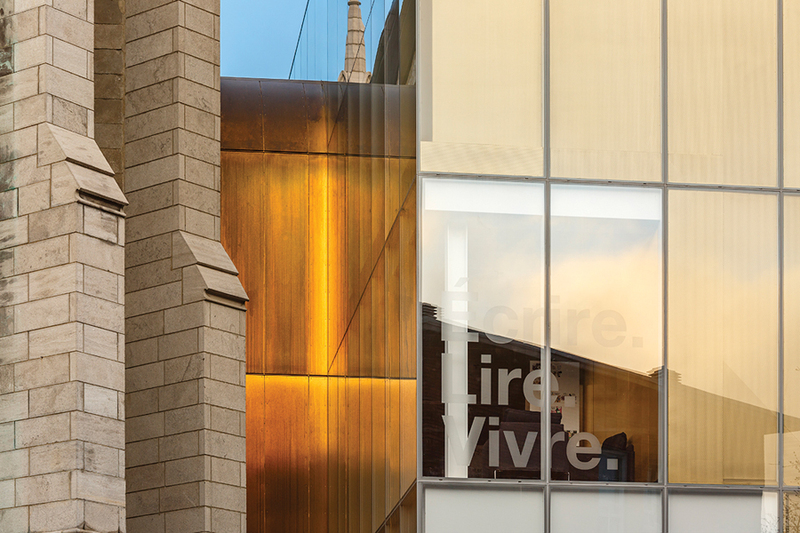 To take a visual tour of the Maison de la littérature de l’Institut Canadien de Québec by Doublespace Photography, click here.